A space capsule that may contain the first-ever samplesfrom an asteroid in deep space has begun one last trek from itsAustralia landing site to Japan ? its final destination after abillion-mile voyage. 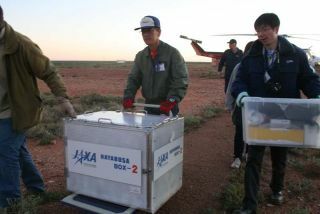 The capsule, which parachutedback to Earth Sunday in the Australian outback, is all that remains ofJapan's seven-year Hayabusa mission that visited the asteroid Itokawa.The basketball-sized capsule is being flown to Japan for its long-awaitedopening to see, once and for all, if it actually grabbed samples of anasteroid. "JAXA has commenced to transport the retrievedcapsule to Japan," the Japan Aerospace Exploration Agency (JAXA) said in astatement. "Certainly, any samples retrieved from Itokawa willprovide exciting new insights to understanding the early history of the solarsystem," Tommy Thompson, NASA's Hayabusa project manager from the JetPropulsion Laboratory in Pasadena, Calif., has said. "This will be theicing on the cake, as this mission has already taught us so much." Japan launched the Hayabusamission in 2003 to visit the asteroid Itokawa, which the probereached in 2005. The ambitious $200 million expedition is the first missionever to attempt to return samples of an asteroid. But the Itokawa rendezvous was not entirely smooth. Hayabusa landed on the asteroid several times to try andgrab samples in its return capsule after a projectile device designed to kickup surface material. A small lander, called Minerva, also failed in its bid toset down on Itokawa. A fuel leak and harrowing ? but temporary ? loss ofcommunication, reaction control wheel malfunctions and ion engine failures alsoplagued the mission, adding three years onto its round trip to Itokawa. Despite those hurdles, the probe's actual re-entry and capsulelanding on Sunday went off without a hitch. Even without an asteroidsample, the mission has been an amazing achievement, scientists said. "It's remarkable that they are managing to get thisspacecraft back," said Don Yeomans, NASA's project scientist for theHayabusa mission. Yeomans said even a few small grains from the asteroidItokawa would be a critical find for scientists hoping to understand how suchspace rocks formed about 4.6 billion years ago when our solar system was young.